Penetrating Damp is caused by water leaking through walls, This type of damp may move around within the building, but this is through horizontal movement rather that by traveling up walls ( as is the case with Rising Damp ). 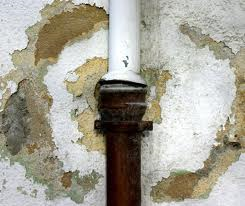 Penetrating damp is usually caused by structural problems in a building, such as faulty guttering or roofing. Penetrating Damp often shows up through damp patches on walls, ceilings or floors, which may darken when it rains. You are more likely to get penetrating damp of you live in an older building with solid walls, as cavity walls provide some protection. If you notice any symptom of Penetrating or Lateral Damp give us a call on 07714 187 053 or book your Free Survey and we will come and help you to deal with it. Rain penetration is most often associated with single-skin walls, but can also occur through cavity walls - e.g. by tracking across wall tiles. This can only occur on external walls and is usually apparent throughout the complete elevation of the external wall. Areas of walls giving high readings on a moisture meter, completely disassociated from any window, floor or roof can usually be assessed as lateral damp. These predominately occur on areas exposed to inclement weather. The most likely causes of lateral damp are bricks that have become porous with age, deterioration of mortar joints and/or cracked renders and pebble-dashing.